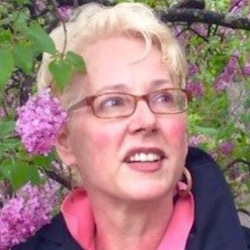 Author Linda Katherine Cutting has had essays and poetry published in The New York Times, The London Guardian, The Beacon Book of Essays by Contemporary American Women, and Salamander Magazine. Her memoir, Memory Slips, which won Barnes and Nobles’ Discover Great New Writers award, and the American Society of Composers, Authors and Publishers’ Deems-Taylor award, was published in seven different languages, garnered appearances on the Today Show, and NPR’s Performance Today, and was optioned for film by Columbia Tristar. The audio version of Memory Slips, published by Harper Audio, on which Cutting read and performed the music, won an Audie award, and was chosen by Audiofile as audiobook of the year. Her flash fiction piece "What Matters" is a selection for our 2015 MuseFlash contest from GrubStreet's Muse and the Marketplace conference in May. It appears in the June 2015 issue of The Drum.